TEMPTATIONS® Hairball Control Treat is rated5.0 out of5 by9. Rated 5 out of5 bykrysascwt fromHair Balls Under ControlSimeon was getting another brand of Hair Ball treatment treat but he wouldn't eat them. When I saw your product, I decided I had to give it a try. It had to be better than having him throwing up frequently. Your product has almost completely stopped the issues with wads of hair which I would find on the floor sometimes daily. Before I started using your product he would try to eat all sort of strange things like SOS pads to try and get the hair out of his stomach. Now there is none of that behaviour. He is a much happier cat at his ripe old age of almost 15 years in September. Rated 5 out of5 bycinder05 fromLove ThemI bought this treat all the time for my cat and she loves them. But they are hard to find in the stores. Why is it when you find something they love, it is no longer available. Rated 5 out of5 byBowesy fromGreat treatI bought this 2 months ago and even though it's a treat I find he's not coughing up hair balls as much. He's got a sensitive stomach and these treats seem to agree with him. Rated 5 out of5 byJustcmcat fromHappy CatsMy cats love these treats! I have tried other treats for them, but Temptations Hairball Control is what they wait for. Rated 5 out of5 byJustcmcat fromHappy CatsMy cats wait for these treats every morning and yes, they do help control hairballs. Chicken By-product Meal, Animal Fat (Preserved With Mixed Tocopherols), Ground Corn, Dried Meat By-products, Brewers Rice, Wheat Flour, Powdered Cellulose, Natural Flavour, Dried Beet Pulp, Corn Gluten Meal, Potassium Chloride, Choline Chloride, Salt, Taurine, Dl-methionine, Calcium Carbonate, Minerals (Zinc Sulfate, Copper Sulfate, Manganese Sulfate, Potassium Iodide), Mixed Tocopherols (A Natural Preservative), Vitamins (Alpha Tocopherol Acetate [source Of Vitamin E], Vitamin A Acetate, Niacin Supplement, Vitamin B12 Supplement, Riboflavin Supplement, Thiamine Mononitrate, D-calcium Pantothenate, Vitamin D3 Supplement, Biotin, Pyridoxine Hydrochloride [vitamin B6], Folic Acid). 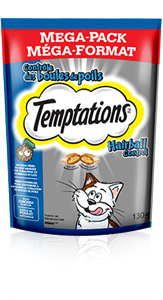 TEMPTATIONS® Hairball Control Treats for cats is formulated to meet the nutritional levels established by the AAFCO Cat food Nutrient Profiles for all life stages. AAFCO stands for the Association of American Feed Control Officials. AAFCO develops standards for dog and cat nutrient profiles which are used as model regulations in the United States. AAFCO feeding protocols are referenced the ""Guide for the Labeling and Advertising of Pet Foods"" endorsed by the Competition Bureau of Canada as well as in the Guidelines for the Canadian Pet Food Industry, developed and administered by the Pet Food Association of Canada. These documents were created to help pet food manufacturers ensure that the food that they manufacture, distribution and sale of animal feeds are safe and of high quality.